I hope you had a fantastic Christmas with the ones you love. 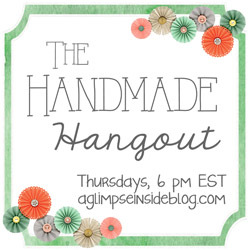 Can you believe this is the last Handmade Hangout Party of 2017 and that 2018 is literally knocking on the door?! CRAZY!! But let's get this party started! SO fun; my first time linking up here and I can not wait to dig into all these ideas! Thanks for hosting.